Battle of the Books (BOB) is a unique reading challenge sponsored by the elementary librarians of 402. The competition encourages literacy skills and teamwork. Students who choose to participate will read different genres and authors as they complete books from a preselected booklist in preparation for “the Battle.” BOB competition is a “quiz bowl” type of tournament among teams at the Garfield. 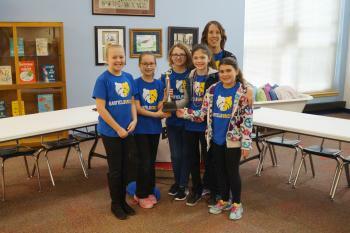 The top two BOB teams from each of the Augusta elementary schools will advance to a district competition in mid-spring. Battle of the Books participants need the support and encouragement of their families to ensure success. We are looking forward to this fun and challenging reading activity. This activity is open to all third, fourth and fifth graders who enjoy literature and are willing to read and prepare for the battle by reading their assigned books from the Battle list. ​The Battle list will be announced in December of 2018.